Monique is a former classmate, former bandmate, and on-again off-again love interest of Trent Lane. Monique appears in the series only twice. In "Pierce Me," we learn that she was once in a band with Trent, and is currently in a band called the Harpies. She says she's thinking of leaving to start her own band, and implies she's thought of this before and changed her mind. In a later episode, "Lane Miserables," we learn that her and Trent keep breaking up and getting back together again. 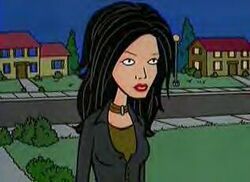 In both episodes, her appearance is disturbing or annoying to Daria, thanks to her crush on Trent, thus explaining the way Monique in fan fiction has deviated substantially from how she is portrayed in the actual series. Her hairstyle varies slightly in her two appearances. In "Pierce Me", she has wavy jet black hair with red streaks, but in "Lane Miserables" those streaks are gone. She seems friendly, but Jane is cool towards her: she tells Trent outright that he and Monique are no good for each other in "Lane Miserables". MTV's "It Takes Two to Tangle" stated the couple are "compatible in many ways in terms of lifestyle and temperament, they may have trouble bonding due to their both being too cool for words". Her mother was mentioned once in passing on the [Reburb] site, the (correct) translation of the French lyrics to ["Ow! My Face"] is "according to Trent's friend Monique's mother". It is clear from this that Monique's mother speaks French, and that she is someone Trent speaks to from time to time; if Monique is an aspiring rock musician in Lawndale, it's not an unreasonable guess that she still lives with her parents. Though in her two appearances on the show Monique is shown as sweet natured and friendly, oblivious to Daria's discomfort at her presence around Trent, fanfics often present her as vicious and vengeful, jealous of Daria's presence and enraged if Trent begins to regard Daria as his new love interest. Daria/Trent shipper stories are, of course, especially prone to this. Diane Long produced a remarkably wicked Monique in "Undone," considered by some to be the archetype for the "evil Monique" stereotype. More recent authors like Richard Lobinske ("Monique's Subtraction" and the John Lane series), The Angst Guy ("A Knight to Remember" and "Smoking Mirror") and Brother Grimace (Legion of Lawndale Heroes) have shown her in a far more sympathetic light, without Daria's perception of Monique as a competitor for Trent's affections. Fairly typical depictions of "evil Monique" in Daria fanfiction include the following. More unusual depictions of Monique get away from the rivalry issues (Daria is, after all, underage in the series) and explore other areas in Monique's life, making her many-dimensioned and often presenting her with serious personal problems of her own that have nothing to do with Daria. Examples follow. Discussion about Monique's accent and background: What is Monique's accent supposed to be? This page was last edited on 19 April 2018, at 20:20.